This story of the trials and triumphs of a boy growing up on a Colorado farm during the Great Depression highlights the importance of strong family ties and friends who lived by the Golden Rule. In addition to revealing personal experiences and family history, the author has given the reader a unique glimpse into the life styles and moral standards of those who lived in rural Colorado during the era of the Great Depression. Changes in methods of food production and advances in technology and medical services are witnessed through the eyes and understanding of a boy growing up at that time. From the humble experience of growing up on a subsistence farm in Colorado, author Bob Forbess received his degree in Mechanical Engineering from UW-Madison and a commission as Ensign in the U.S. Navy. He spent the next twenty years in the aircraft/aerospace industry and became the Assistant Chief Engineer of the company that developed special ignition devices for all the manned Apollo space flights to the moon. At age forty, he and his family returned to the University of Wisconsin in Madison where he received a master’s degree in Educational Administration and served in various administrative positions and taught some seminars on management. After retiring in 1991, he served on several boards of non-profits including the Second Harvest Foodbank, Bethel Horizons, Harvest of Hope and Friends of Schumacher Farm – all in or near Madison, Wisconsin. 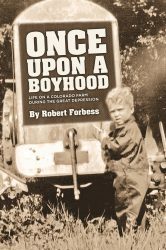 From his experiences as a farm boy, to his interest in science and engineering and much more, author Robert Forbess paints interesting word pictures that are filled with detail and personal history: life on a Colorado farm during the Great Depression, early schooling, threshing crews, and fishing— all here and more.